Callot Model of Moire Crepe Gilda. Paris Spring Season 1913. Home » Callot Model of Moire Crepe Gilda. Paris Spring Season 1913. Theatre Gown of Besnard Color Moire Crepe Gilda. Skirt draped. Buttons to match material. Beads and silk embroidery at foot of skirt. Deep girdle of material. Waist of ecru shadow lace. Sleeves trimmed with two deep ruffles of same lace. Wide ribbon to match material with a loop and two ends and bouquet. Narrow gold lace at neck. Coat embroidered as bottom of skirt. Buttons to match. Published by Haas brothers. 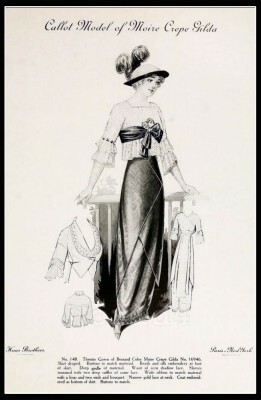 Créateur couturier Callot Soeurs.